Adults can usually see the big picture, but all Caleb sees are the obstacles of Cystic Fibrosis and the shadow of his older brother. Kit’s big picture life is dysfunctional and challenging, and in order to survive it she creates a smaller, magical world … and invites Caleb in. Every Beth Vrabel book I review includes the caveat that I’m not really a YA/middle grades fiction fan. Well call me a convert. I just can’t say it anymore, because I truly love Vrabel’s tales of kids living with a disability, finding their place, figuring out who their true friends are, and growing into independence and self-advocacy. Vrabel uses humor to explain Caleb’s CF troubles, in a way that any middle-grader will find entertaining (i.e. there’s mention of poop). She also creates a family that loves Caleb so much it’s stifling — a feeling most tweenagers know well. Reading Caleb and Kit, I was totally schooled on how much effort it takes to get through a day when you have a medical condition – or, in Kit’s situation, a dysfunctional home life. And Vrabel writes it all very casually and brightly… no gloominess allowed when describing the facts of someone’s daily existence. 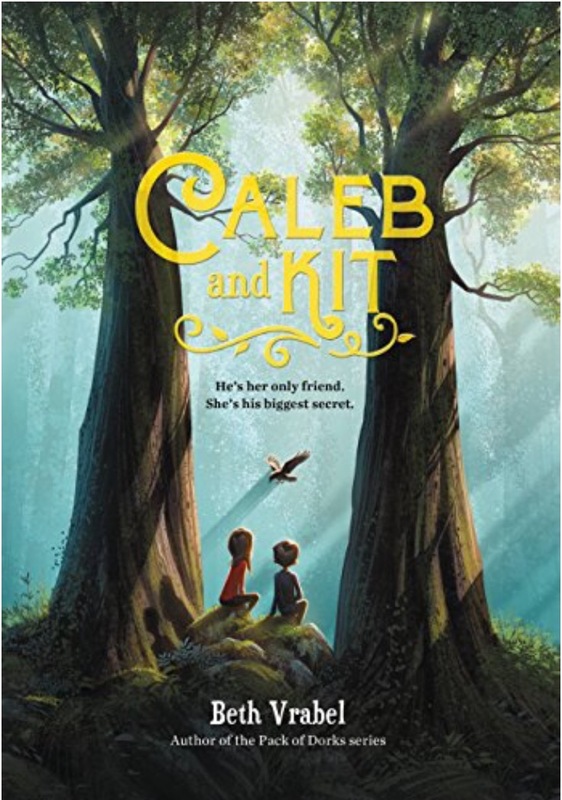 When Caleb and Kit find each other, they create a special kind of friendship that isn’t based on dependence, but on believing in each other so they might believe in themselves and grow to be independent. As Vrabel explains scientifically, just look at the trees and you’ll see! You’ll have to read the book to find out where their friendship ends up, but know this: Over the course of the chapters, my heart grew tender for Caleb and Kit, and yours will too. First, I understand why many authors use alternating narrators, but frankly it just confuses me and makes the story choppy and less engaging. Beth Vrabel is so clever that she didn’t need to use alternating narrators, because she used Alice as the narrator for book one and Richie Ryder as the narrator for this book. Presto: The benefits of alternating narrators without the abrupt shifts every chapter! 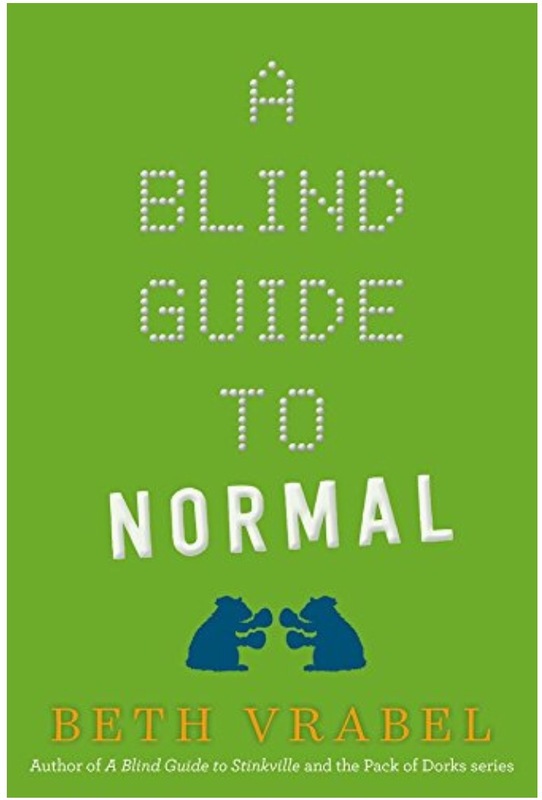 My most favorite facet of A Blind Guide to Normal wasn’t the fabulous karate competition or the yard horse or even Richie Ryder’s heartfelt friendships with quilting classmates and Alice and Jocelyn and Max. The best part of the book for me was the ending, where everyone figures out that fear is pretty much the ONLY thing that’s normal, and where Beth Vrabel again writes a book within a book. Ever been to summer camp? How about summer camp caveman-style, while the campers next door get tech time, fancy snacks, and air conditioning? 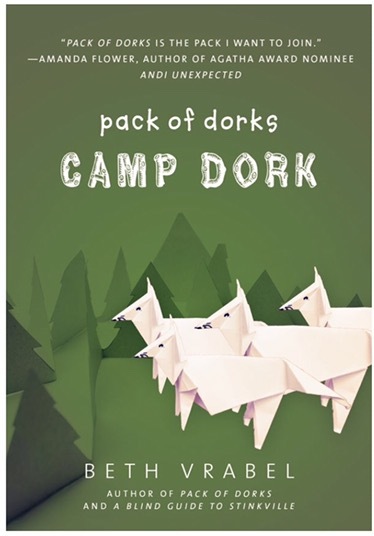 In this sequel to Pack of Dorks, Lucy’s time at camp nudges her on a journey of self-discovery. Lucy explores her feelings about her new best friend who transforms physically and socially, the flush of emotions when she thinks about boys – especially Sam, and her compulsion to arrange couples in neat and tidy relationships. All this while she struggles to get a decent supper and keep everyone from hating her! My favorite thing about this book is the dialogue. As I read, I could really hear the kids interacting… their different voices, noisy sound effects, and gurgles of bodily functions… just like kids I know. Lucy and her friends are real – kind of like a younger Breakfast Club, where stereotypes and prejudices only get you so far. Like the Brat Pack, Lucy and her Pack of Dorks find that facing the truth about yourself and others is the real prize. While my reading tastes skew older (like the 40-something mom I am), I enjoyed Lucy and her friends. Author Beth Vrabel offers insightful nuggets that can drive even grown-ups to make some changes in how they view and treat others. I’m not exactly a YA reader. I like realistic fiction with protagonists my own age – I can just relate better, you know? 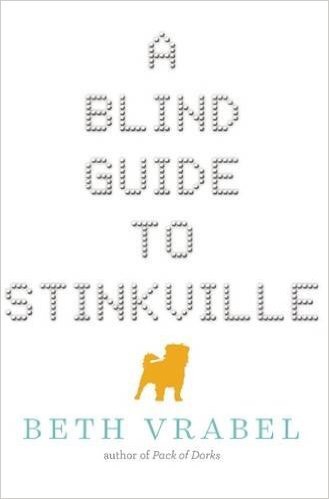 But A Blind Guide to Stinkville reeled me in. I was laughing in Chapter One. I was invested by Chapter Three. I was bawling my eyes out in Chapter Seventeen… but that’s for later in this review. Alice moves across the country and, like the rest of her family, is having a hard time adjusting. Besides the friend factor and the school factor, Alice has some physical challenges that were much easier to handle when everyone in her old town had known her since she was born. In Stinkville, Alice has to learn how to do things without the predictable help of those around her. I am SO IMPRESSED with Vrabel’s consistent pace and even-keeled writing. Alice could be barely holding it together, or the girl in the library could have just revealed something astonishing, or a new friend could be just as mean as the old friend just was… and Vrabel writes it all very matter-of-factly, like none of these things are the end of the world. No melodrama, here. No way. And that’s totally refreshing in a world of melodramatic teenagers and melodramatic teenage books. I know that when my children read Stinkville, they will accept the characters and their idiosyncrasies without batting an eyelash. They will understand that differences are No Big Deal. And maybe they’ll realize that all the things they’ve been practically fainting about in their real lives are also No Big Deal, because, hey, Alice got through much more challenging circumstances with far less indignity. I am also excited for my children to read Stinkville so they might be eager to be more independent, be inspired to find their way around their town (literally and figuratively), and be able to navigate new situations with grace and purpose. So, Chapter Seventeen. Well, I had just taken a break after reading the first sixteen chapters, and I was ready to settle in for two wonderful last chapters – my favorite chapters in any book. Beth Vrabel threw me for a loop and wrote something so funny and so heartbreaking that I choked out a laugh and then proceeded to cry my head off. I cried and laughed until I finished the book. I’m a mom, and I get emotional when I read about children struggling – or in this case, overcoming their struggles so well that my heart fills up. Everything in A Blind Guide to Stinkville seems so real that I want to say You Can’t Make Up This Stuff. But Vrabel did. She put her imagination together with her experiences to create something so wonderful that I need to read it again. Oh, and that Blind Guide that Alice wrote? Stories within a story are brilliant, Beth Vrabel. Add me to your fan club.